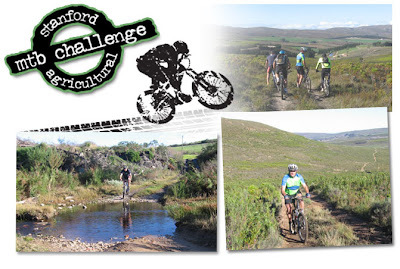 Join us on Saturday, 20 September 2008, for the annual Stanford Mountain bike race. This year the race is on Paardenberg Farm, next to Salmonsdam Reserve. and wine farms and over the fynbos mountains. Sections cover the same route as the 2008 Cape Epic. Bring the whole family and join us for the day or make a weekend of Stanford’s hospitality. The start/finish is in the picturesque "akkerbos" on the farm. Lots to keep you busy - donkey cart rides, tractor rides, local wine, beer for sale. Entries on morning of race. Turn right, drive for 7.2 km to Salmonsdam turnoff.